Pursuing the flourishing life and human liberty through literature. This has been a dismally slow Read of England, between a history book more dense than I'd expected, and the fact that I have been utterly absorbed in the world of Red Dead Redemption since mid-March, and when I say utterly I do mean it. I've listened to no podcasts, no audiobooks, and I have played almost nothing else. And..I've read two books. Although I expect to be finished with To Rule the Waves by this evening, I thought I'd share some photos from in-game. 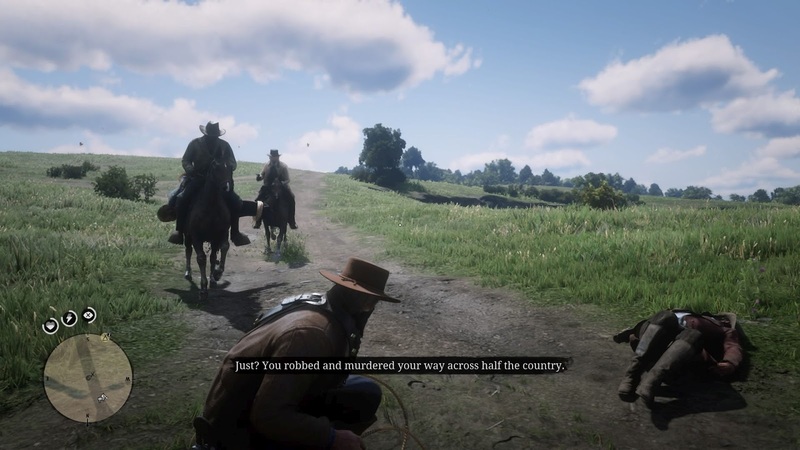 A favorite random moment of mine: I was in the middle of some mischief when two bounty hunters rode past, lecturing their captive about his misdeeds while I crouched mid-loot in my mask. Very awkward. RDR2 is an open-world game set in 1899, in a time of transition; the west is being broken and civilized, but there are more than a few stubborn diehards to keep the dream of a free life alive. The player belongs to a close-knit community of such rebels, who begin the game hiding in the mountains from some debacle. Before long the winter is over and the story really begins, with the caravan of men, women, and at least one child making their way into a comfortable camp in the woods southwest of the great plains. 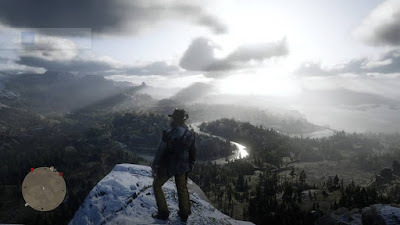 Although the immediate surroundings are very reminiscent of old west landscapes, there's much more to the game's world than that -- and from the very beginning, almost all of it is open. 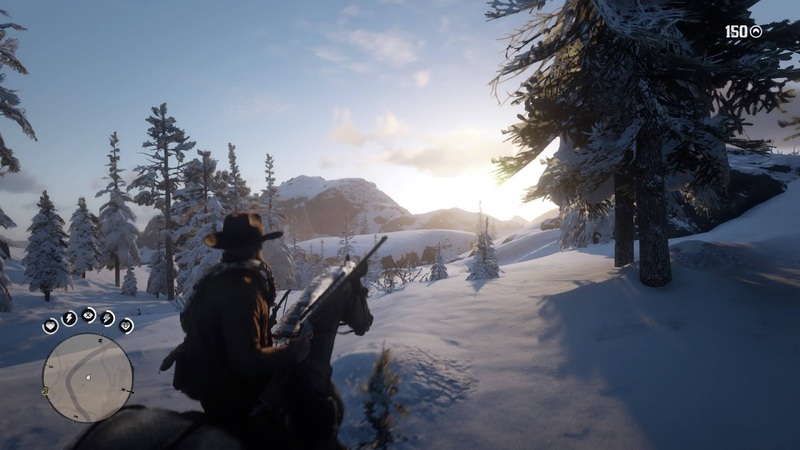 In my first week of playing the game I had traveled far and wide, exploring roads that let me into swamplands, rugged dark forests, mountain communities where the only road is a trail barely wide enough to ride a horse down, and still more. 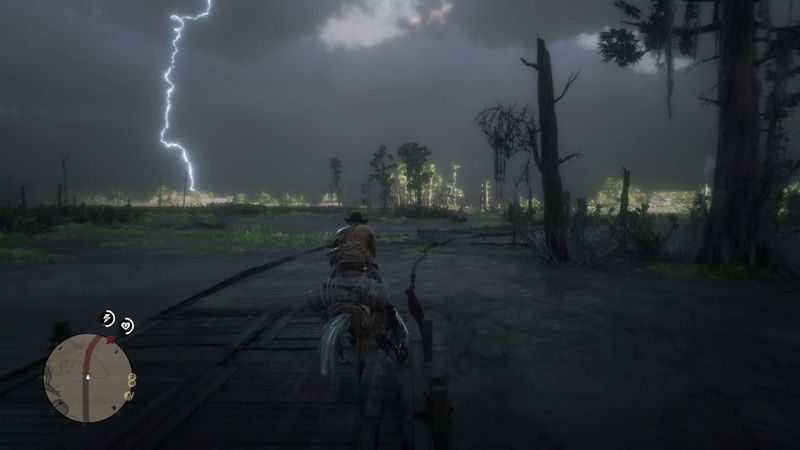 The game's weather system, and the constantly changing lighting effects, allow for still more experiences: the bayou is a very different place at night, or when there's a thunderstorm rolling through. 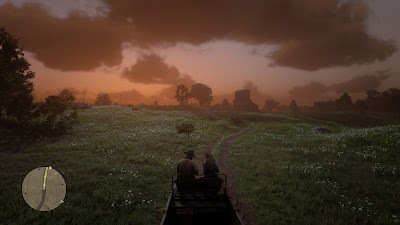 The game's cargo system allows players to store clothing on their horse, so if needed they can don a heavy overcoat when headed into mountain country, or strip down to just a shirt while moving through the bayou. The landscape changes with the weather; snow falls, puddles develop in wagon-wheel ruts. I have not yet stopped goggling at the clear imprint made by a rolling wagon, or footprints, or a bloody trail left in the snow by a stricken animal. Took a ram on my way to track a legendary bison, and had to admire the snow effects. While the weather goes a long way to making the world of RDR2 feel alive, its inhabitants do most of that work themselves. The landscape is full, and I mean full, of animal life, creatures great and small. The variety of birds is staggering, as is the number of small mammals -- and then there are the big ones, like deer, boars, elk, bears, cougars, etc. Hunting is a big part of the game, as one legal way of generating money the player badly needs at the beginning; it also provides food in abundance, and clothing later on. As the player moves through the landscape, he meets other travelers -- some friendly, some not. Others are out fishing, panning for gold, hunting, etc -- and many present opportunities to the player. These often present the player with a simple choice, to help or to ignore, but opportunities often have unexpected consequences. A woman pleading for help may be in distress....or she may be a lure to lead you into an alley to be ambushed. 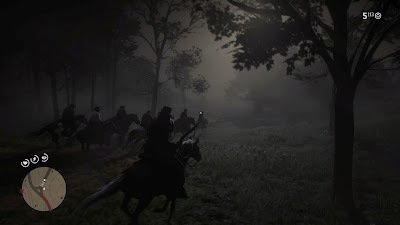 The player is not the only resident of these lands capable of getting up to mischief: there are other gangs who operate in different areas of the map who will ambush unsuspecting travelers, and if they are resisted -- as I did, with dynamite and a sawed-off -- they develop a special hatred toward the player and will deliberately target them. 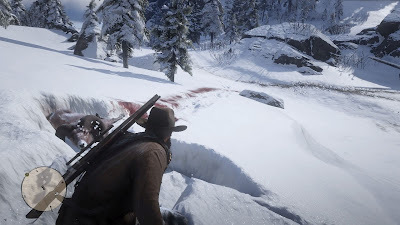 It didn't take me long to start traveling with my sawed-off at the ready, and with a wary eye casing the road ahead, looking for spots where I might get ambushed. I often went off-road to avoid areas with a hill or large rocks beside the road, and when I needed to travel across a high-risk area like a covered bridge, I did so at full gallop ready to rain shot on anyone. Other travelers are likewise cautious, and if you follow too closely they will draw on you. And then there's the story, as the player witnesses slow disintegration of a nomadic community, brought on by both the forces that oppose them (a very dedicated Pinkerton agent), the self-destructive lifestyle a few of the members live, and the fact that their leader is astonishingly bad at judgment calls. I'm approaching the end of the story, the final chapter, and suspect I may be a little bummed when I get there. Even afterwards, however, I think this will be a game that becomes a persistent part of my leisure, a world I enjoy spending time in -- like Lost Heaven (Mafia) or Vice City. 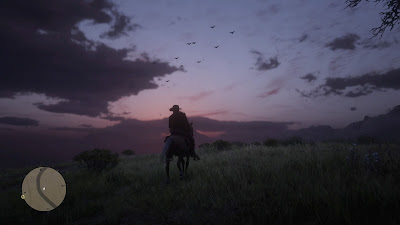 It is by far the most visually stunning and content-rich game I've ever tried. Think of English history, and longbows, tall ships, and shieldwalls may come to mind; think of France, and perhaps the image is knights charging across an open field. But American history, from the colonies onward, has been written in guns. Hunting frontiersmen became rebels, created a nation, expanded its borders far and wide, and protected itself from enemies within and without. In American Gun, a much-lauded Navy SEAL reviews the history of ten firearms which have an outsized role in American history. 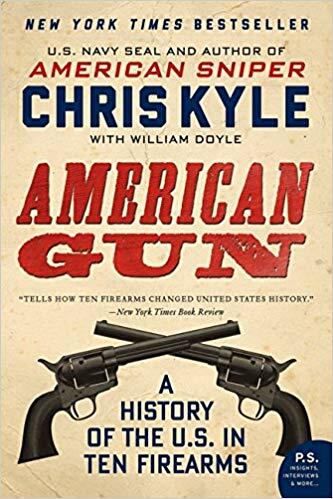 Beginning with the long rifles of the colonial militia and wrapping up with the M-16 that began to be used two hundred years later, Kyle's personable history mixes technical and political history; each chapter delves into the background of the firearm, the circumstances that prompted it to be designed and the path it took to be accepted. These are not all military weapons; the Colt that graces the cover of the book and the Winchester 1873 rifle were pervasive in the late 19th century as settlers filled and civilized the west, and a pistol associated strongly with the police appears in the latter half of the book. The ten guns are mostly rifles and pistols, with the Tommygun being an outlier; there are no shotguns. I read this chiefly because I thought it was such an interesting angle to view American history from, and quite appropriate. I was especially glad to read histories of pieces I have a fondness for, the Colt 1911 and the M1 Garand. There's a lot of fascinating trivia in here; I'd long regarded the scenes of Lincoln firing Spencer repeating rifles on the White House lawn as fanciful, but apparently he was quite the shooting enthusiast. 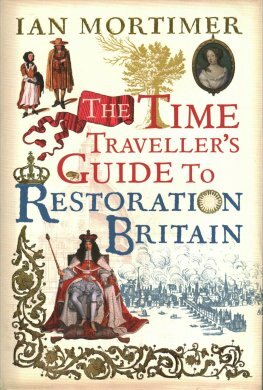 Having previously guided readers through the Medieval and Elizabethan eras, Ian Mortimer now welcomes intrepid travelers to the Age of Restoration. The tyrant Oliver Cromwell is dead, and with him went his grim police-state 'republic' and the armed doctrine of puritanism. Long live the King, the Church, and debauchery! The return of music, theaters, and lecherous kings isn't the only thing to celebrate; England's merchant ships are traveling the world and increasing the amount of interesting foods and items to buy by the year, and the razor's edge clarity of science is now being honed. The country is being re-made by the year; in London's case, literally, because the Great Fire destroyed much of its medieval core and warranted a partial redesign. This is a transitional age; more and more people are living in cities, enough that the countryside is developing appeal as a break from the city, and traveling purely for leisure through rural areas develops. This is still not an age modern travelers would be wholly at ease, in, however; religious opinions are dangerous to express if they differ too much from Anglican orthodoxy (Quakers and Catholics be warned! ), gentlemen will duel at the drop of a hat, and severed heads on pikes are still civic decor. Here Mortimer revives the tour-guide delivery of the original guide to Medieval England, detailing the different kinds of lodging and foods to expect, points of interest, and how to avoid being arrested. As ever, I thoroughly enjoy this visit with Mortimer. Captain Arthur Sloames stepped off the boat with a terrible secret. He wore on his shoulders the coat of a dead man. When his transport left England, he was but Jack Lark -- a crushed and anxious common soldier whose ambition had led him to become an officer's aide. That officer perished of fever en route to a new command, however, and seizing on the opportunity Lark has assumed the man's identity. 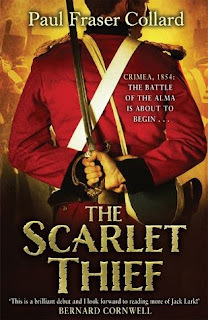 It's not as if he can do worse than the stuffed shirts leading the army now, after all -- but faced against Russian cossacks and massed artillery, Lark soon realizes being the man who gives the orders is never so simple. As mobs of uniformed men are thrown into battle against one another, Lark is doubly challenged: first, to survive the brutal opening of the Crimean war, doing right by his men; and to maintain his charade surrounded by officers who are not nearly as dimwitted as they appear from a distance. Imagine the frantic action of a Bernard Cornwell novel, but with the humor drastically downplayed; that's the general feeling here, as Fraser is just as good at thrusting readers into the heart of battle and keeping the pages flying by. The working-class character suddenly turned officer is very reminiscent of Sharpe's backstory, though Lark's promotion is one of stolen valor -- or rather, borrowed, because Lark may pose as an officer but he's a courageous soldier who doesn't shy from leading his men from the front. What he leads them into is not always advisable, but it wouldn't be a novel without disasters to test characters and learn from. There are enemies both foreign and domestic; there are the Russians, of course, but Lark is also dogged by an old enemy who has inexplicably turned up in Crimea as well. What will make Jack Lark stand out, I think, is not so much his similarities to Sharpe, but how very different his story will become. The novels to come take Lark to India, Persia, and beyond, with roles beyond the battlefield. I'm especially intriuged by the idea of an English soldier fighting for the Shah. Ah, dear readers, it’s that time again – April, a wonderful month of warm sunshine and cool breezes, and with them both a dream of another land. 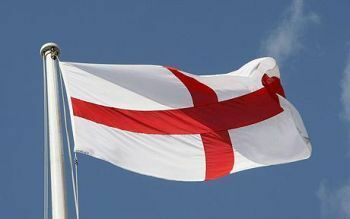 It’s READ OF ENGLAND time once again, a monthlong dive into English literature and English history. I’m fully prepared this year, with a tin of loose leaf Earl Grey and some imported cookies - er, ‘biscuits’ -- from England. And I’ve got books, of course, loads of books. The Vicar of Wakefield, a classics club entry. The Decline and Fall of Rome, Volume I, Edward Gibbon. This one is primarily a classics club entry, but I can get away with it in April because Gibbon has such a reputation as a master of English prose. The Scarlet Thief, Paul Fraser Callard. Crimean war historical fiction, I think; I purchased this one a few years ago during a sale . Ten Cities That Made an Empire, a most interesting-sounding take on the British empire that focuses on colonial cities as hubs of commerce that made the Empire so successful at its peak. This one I'm...not sure about. The Postal service claims they delivered it, but there's no trace of it. That's...a lot of history, and Gibbon will take time enough it's likely I won't get through everything. Still, I'm really looking forward to it! Alice and the Assassin, R.J. Koreto. 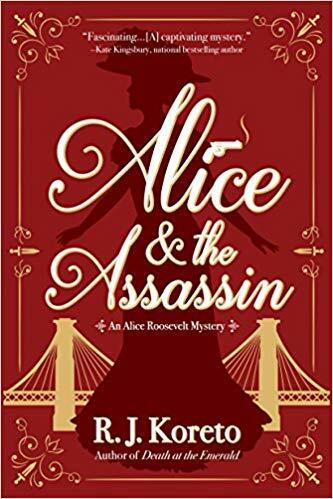 Entertaining historical fiction following the infamous pistol-packing Alice Roosevelt and her cowboy Secret Service bodyguard. Following the assassination of President McKinely, Alice's father is made president and Alice herself turns detective. Declaring that it doesn't make sense for a feeble-minded Polish anarchist to randomly go after the president, Alice and Agent St. Clair begin following leads on their own -- to the faint horror of Alice's official guardians, Teddy excepting. The chase takes them into private society clubs and public brothels, alike, consorting with the likes of Emma Goldman, Sicilian crimelords, and members of the New York yacht club. Most interesting is the relationship between St. Clair and Alice; St. Clair is a former cavalrymen, former frontier sheriff turned federal agent, while Alice -- for all her wildness -- is a teenage girl who has been far more sheltered than she realizes. The two have an interesting fondness for one another by the end. 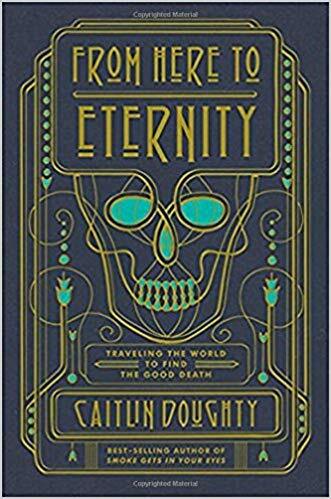 From Here to Eternity, by Caitlin Doughty, visits several cultures around the world to examine particularly interesting death customs, in a bid to convince western readers that pickling the dead and shoving them into an airtight vault at ludicrous costs to ourselves, is neither normal nor attractive. Although it doesn't have nearly the strength of her first book (Smoke Gets In Your Eyes, her account if becoming a mortician and developing a funerary style more in keeping with older customs. She promotes, for instance, the practice of families washing and dressing their deceased loved ones themselves, and taking part in the burial or pushing the button on the crematory. Traditions like those are those she explores here, though she's naturally drawn to more...unusual death traditions, like people collecting and decorating human skulls to use as magical tokens, or occasionally exhuming their dead kinfolk to dress them and give them tea. As with her previous book, this one is laden with humor, both in the writing and in happenstance; at one point Doughty was left alone in a cave of skulls and was stumbled upon by tourists, who immediately asked if they could take her picture in terms taken from Emily Post, circa 1915. Although the book's contents were not as deep as the last one, I was cheered by the promotion of natural-burial movements within the US, which is also covered here. Open Life: The Philosophy of Open Source. Penned in 2004. Open Life offers a history of the open source software movement, an appraisal of its financial prospects, and a look at how the open source philosophy might be applied to matters other than software. Admittedly, this is esoteric, and...dated. Most people use open source tech, even if they don't realize it: Android devices, for instance, and even chromeOS, use Linux at their base, as do many internet servers, and IOT devices will only bring more of it into people's homes. A lot of the projects that Ingo mentions here (in examining different ways open-source software companies can be profitable while maintaining their roots) have since been discontinued, though others (Red Hat) are still around. One of the bigger success stories is Mozilla, the first great challenger to Internet Explorer which has matured into Firefox. Finally, I also read my two classic club entries for this month, both by Walker Percy. It turns out I'm not much for existentialist novels, even if they are by a southern author. In 1899, railroad tycoon Edward Harriman organized a multidisciplinary expedition to Alaska, bringing with him some of the best scientists and artists in America. They sailed -- or rather, steamed -- their way around the coast of Alaska, pushing as far north as possible. Over a century later, Mark decided to repeat their journey, to discover for himself the stirring beauty of America's 'last frontier', and to compare his experience with those of Harriman's. The result is a winsome mix of history, nature writing, and travel that concludes with Adams' urgent message to readers: if you want to see Alaska, go now, because it's a land continually re-created, and even now many of its places are melting away, are being reclaimed by the sea, or likewise stand on the brink of transformation. 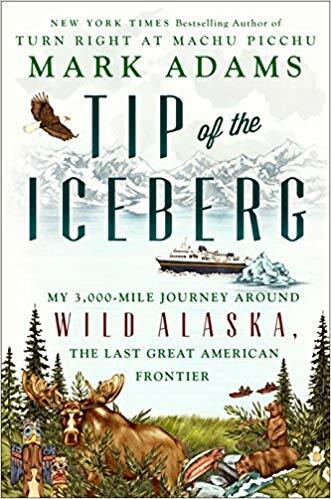 Although I've never previously been interested in Alaska, Tip of the Iceberg has made it a far more compelling place, both for its natural grandeur and its culture. A young fogey at work in a small-town library, enjoying the good life of a historic community.